Over 90 park supporters from Menlo Park, Redwood City and East Menlo Park painted, pruned trees and detailed the play structure at Flood Park to show their support for the park as part of National Public Lands Day on Saturday (9/24). Boy Scouts from Encinal and Laurel Elementary Schools, Pack 565, Den 4 (pictured left), washed and waxed the play structure which has been out of use for over a year due to the park closure. 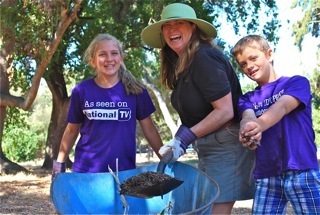 Menlo Park City Council members Kirsten Keith and Kelly Ferguson (pictured below with children) joined volunteers ages two to 790 plus in preparing Flood Park for its (temporary) reopening later this fall. Four members of Summit High School’s Baseball team racked leaves and carted away debris in Flood Park, the home of their practice and game fields prior to the closure of the park last fall for PUC pipeline repairs. This event was cosponsored by Friends of Flood Park and the San Mateo County Parks and Recreation Department, which provided staff and equipment for the families and individuals who came out to work. The park has been fenced in and shut this year to accommodate heavy equipment , trucks and pipes required by the San Francisco Public Utilities Commission (PUC) pipeline replacement project near Bay Road. (For more information on the pipeline project, contact the PUC at (415) 554-3289, by email at [email protected] or visit the agency’s websitefor project updates). The San Mateo County Board of Supervisors has granted a temporary reprieve to the shuttered park, which was slated to be closed indefinitely due to San Mateo County’s budget woes after the pipeline repairs are complete. San Mateo County Supervisors reversed course this summer and announced a six month temporary reopening of Flood Park (by the end of this year) while they examine their long-term plan for all county parks and the City of Menlo Park’s Department of Parks and Recreation examines the viability of Menlo Park taking over ownership of Flood Park. The temporary reopening of Flood Park is a victory for neighbors of the park. The new organization, Friends of Flood Park, grew out of a grass root effort by the park’s neighbors and fans to see that Flood Park remains open for local families beyond the current six month reprieve provided by the county. For more information on Friends of Flood Park, email them at [email protected].